A purchase agreement with DTE – to convert 223 mercury-vapor cobrahead streetlights to LED technology – has been approved by the Ann Arbor city council. The up-front cost of the conversion will be $69,555 – but that amount will be reduced to $55,060 after rebates. The annual electric bill from DTE for the 223 streetlights is currently $45,128. After conversion, the projected annual cost will be $30,910. The savings would result in about a 3.1-year payback period on the net cost of $55,060. City council action came at its June 16, 2014 meeting. The city is billed for 7,431 streetlights – of which 5,216 are DTE-owned. Of the 2,215 city-owned lights, 1,923 have LED fixtures. None of the streetlights to be converted under the agreement ratified on June 16 are in the Ann Arbor Downtown Development Authority tax capture district. Streetlights in the DDA district were part of a similar proposal considered by the DDA board at its May 7, 2014 meeting, but postponed by the board at that meeting until June 4. By the time of the June 4 meeting, however, a decision had already been made that the DDA would not be funding an LED conversion this year. [DTE's program has an annual cycle, but is not necessarily offered every year.] If the DDA board had approved funding for converting lights in the DDA district, it would have affected 212 non-LED streetlights. 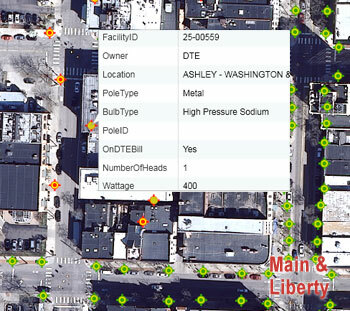 Streetlight locations are mapped in the joint Washtenaw County and city of Ann Arbor GIS system. 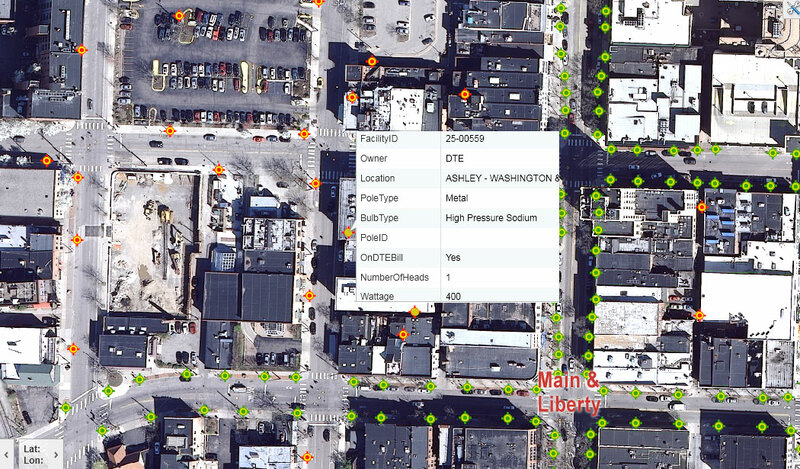 Data available by clicking on icons includes ownership as well as the lighting technology used. This one is a high pressure sodium light operating at 400 watts. The project the DDA declined to fund this year would have included converting 100 watt MV (mercury vapor), 175 watt MV and 100 watt HPS (high pressure sodium) lights to 65 watt LED (light emitting diode). Further, 400 watt MV and 250 watt HPS lights would have been converted to 135 watt LED. Finally, 1000 watt MV and 400 watt HPS lights would have been converted to 280 watt LED. Currently, the city pays DTE $72,585 a year for the energy used by the 212 downtown streetlights. After conversion, the annual cost for the 212 lights would be expected to drop to $51,895, for an annual savings of $20,690. In deliberations at the DDA board’s May 7 meeting, DDA board member Roger Hewitt opposed the grant, because the savings that would be realized accrues to the city of Ann Arbor, which pays the energy bills for the lights. Hewitt noted that the relationship between the city and the DDA includes a number of fund transfers to the city. Even though the amount is not huge, Hewitt said, the expenditure of several small amounts could eventually impair the DDA’s ability to pay for major infrastructure improvements. Other board members joined Hewitt in their concerns, questioning what projects might be sacrificed if the DDA paid for the LED conversion. Concern was also expressed over the possibility that the result of a streetscape framework planning effort could result in a decision to replace all cobrahead lights in the downtown area with pedestrian-scale lampposts. And that would mean that the new LED fixtures would be used for only a short while. For deliberations at the council’s June 16 meeting, see The Chronicle’s live updates filed during the meeting.